Hispanic Studies’ Spanish House (Casa Hispana), a residence for majors and minors of Spanish, has just published its new website: http://casa.cofc.edu. Downloadable application forms, contact information and student testimonials are all available at the site. 2011 Issues of HispaNews Now Online! Thanks to the fine work of this year’s HispaNews Editorial Team— Nadia Avendaño, Karen Berg, Lola Colomina Garrigós, Ben Fraser, Claudia Moran and Jennifer Smith—I am pleased to inform you that the 2011 issue of HispaNews (official newsletter of Hispanic Studies) is now available at http://spanish.cofc.edu/about/hispanews.php. 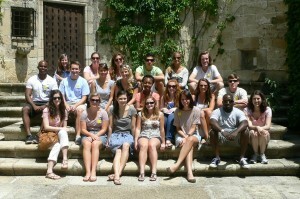 Visit the Global Scholars Website at the College of Charleston. This past spring 2011 semester, Dr. Sarah Owens directed Hispanic Studies’ Spanish 400 course, Service Learning to the Hispanic Community. 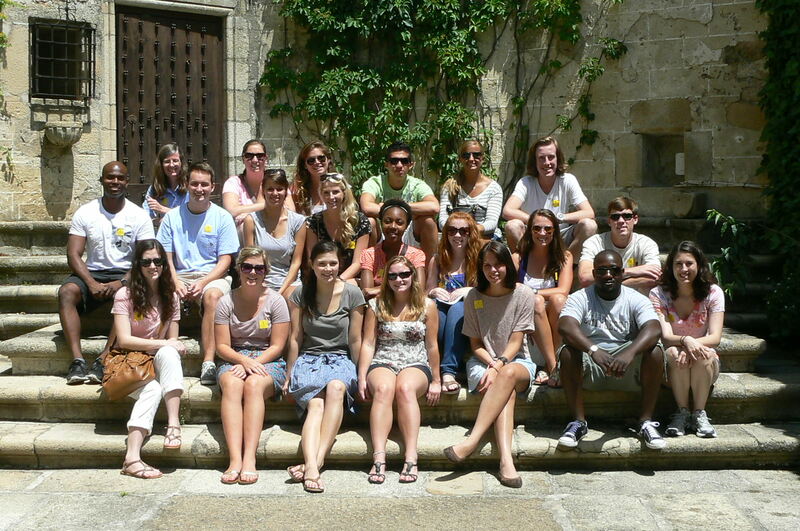 After an interview process in the fall of 2010, Professor Owens selected 17 highly motivated, junior and senior Spanish majors who had studied abroad. Each student was required to complete a 45 hour internship that involved assisting the local Hispanic Community. Students were able to choose from a wide array of possibilities to include participation as interpreters in local health clinics, tutoring Hispanic children at a local elementary school, teaching English as a second language, and assisting maternity classes for expecting mothers. The students of this course also met on a weekly basis to discuss their experiences and to learn about different topics such as immigration, education, health and politics that affect the local and national Hispanic populations in the United States. Under the direction of Drs. Félix Vázquez and Marianne Verlinden, 21 College of Charleston Students spend May 11-June 16 studying abroad in Trujillo, Spain. 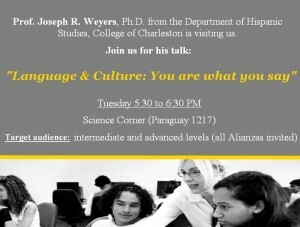 During his research trip in Uruguay, Professor Joseph R. Weyers was guest speaker at the Alianza Cultural Uruguay-Estados Unidos where he delivered his presentation “Language and Culture: You are what you say” on Tuesday, May 10, 2011. 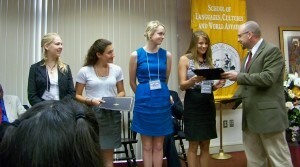 Dr. Mark P. Del Mastro, Chair of Hispanic Studies, Recognizes the 2011 Distinguished Majors of Spanish. 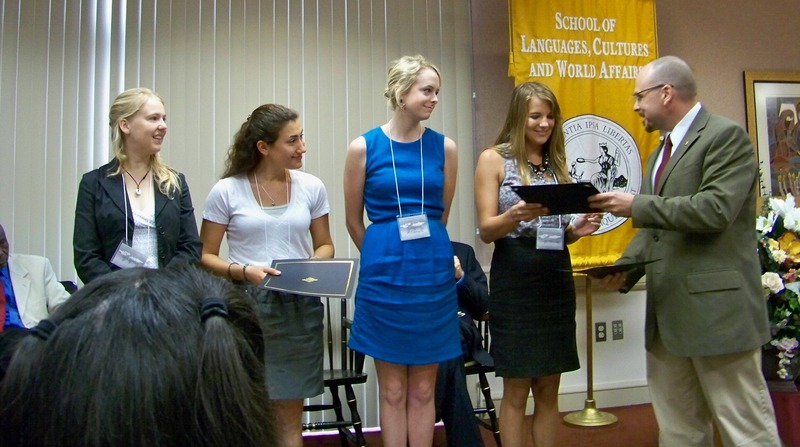 On May 6, 2011, the annual Student Awards Ceremony of the School of Languages, Cultures, and World Affairs recognized six different Hispanic Studies Students for their outstanding academic accomplishments. Sara Sprehn was honored for receiving a Fulbright Scholarship, the Graeser Memorial Award (outstanding school-wide language major), Most Accomplished Spanish Major and Distinguished Major of Spanish. Dylan Kornegay was recognized for receiving the national Gabriela Mistral Award for her academic accomplishments and initiative with the College of Charleston’s Chapter of the National Collegiate Hispanic Honor Society. Katherine Williamson was awarded Outstanding Major in Spanish; she was also named Distinguished Major in Spanish along with Lauren Glaser and Christin Stewart. The Most Accomplished Portuguese Student Award was presented to Candice Thompson, and the Transfer Student Awards for Outstanding Academic Achievement were given to Lauren Brown and Sharon Ramirez.